David graduated with a Masters in Osteopathy from the British School of Osteopathy in June 2015. He is a registered Osteopath with GOSc and the Institute of Osteopathy. He has just completed courses in Sports Massage and Medical Acupuncture to compliment his Osteopathic Treatments. 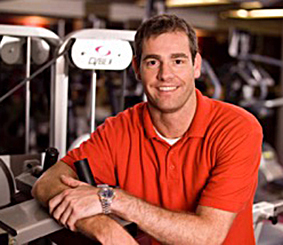 Over the last 20 years he has developed a strong reputation and has vast experience working in the Fitness Industry and has run a successful Personal Training business since 1999. He considers himself a structural Osteopath and combines Osteopathy with rehabilitative exercises to manage his patients and to restore function and health. During Davids final year he took part in a 12 week elective called OsteoMap which provided David with skills including mindfulness techniques to work with and understand patients suffering from Chronic Pain. As well as training clients for events David has completed the NYC marathon, London Marathon, London Triathlon, Ballbuster duathlon, Royal parks and Brentwood half marathons. David provides treatment using a wide range of modalities from osteopathic treatment, sports massage, medical acupuncture, exercise rehabilitation and prescription. David treats musculoskeletal conditions caused by injury through sport and exercise to ailments pre-disposed and maintained by the rigours of everyday life. David looks at ergonomics, corrective and functional exercise and how the body functions and why it sometimes leads to dysfunction and injury. A principal of Osteopathy is to treat the patient not the condition. David believes that getting to know the patient by spending 60 mins with new patient is essential for a better treatment and working diagnosis. Osteopaths are highly trained and educated practitioners who are primarily taught to understand the patient by taking a detailed medical case history, performing thorough examinations leading to an effective treatment.